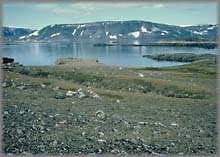 he Countess of Warwick's Island, as the Elizabethan explorers named it, is a small, mostly barren island located approximately 500 m off the northeastern shore of Frobisher Bay; it is today known as Kodlunarn Island. Over four hundred years ago, it was the headquarters of Martin Frobisher's mining activities. 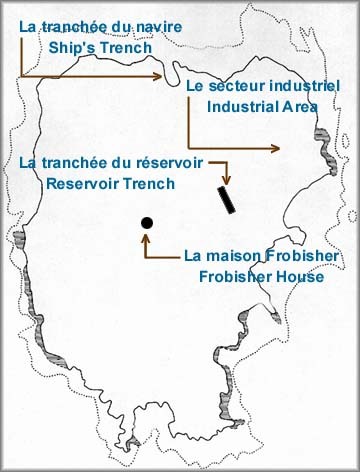 Through archaeological investigation, mostly by non-intrusive methods, several main features related to the Frobisher expeditions have been identified. Aerial photograph of the Countess of Warwick's Island, now known by its Inuit name, Kodlunarn Island. 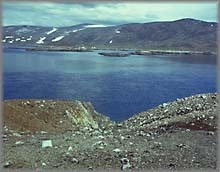 The remains of Frobisher's mines are clearly visible. The "Ship's Trench" is a large feature cut into the northern coast of the island at its midpoint. This name is based on information gathered from the Inuit by Charles Francis Hall. 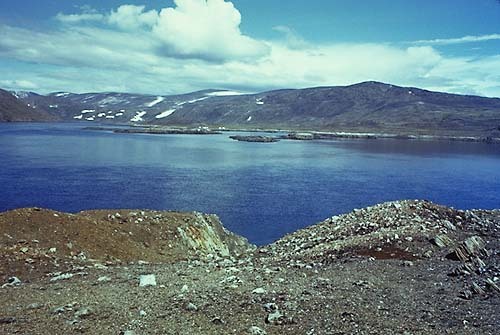 Inuit oral history suggests that the Trench was used as a slipway for constructing or repairing ships. 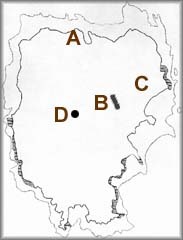 However, the cut probably follows the strike of an ore vein and was in origin probably the first mine opened, in 1577. The trench measures about 25 m long and 5 m wide, slanting upward from the high tide line to the surface of the island. It would likely have been used as the main accessway from the beach to the island's surface, and for transporting ore to boats to be rowed out to the fleet. It was also one of the sites where unused supplies from the 1578 expedition were buried. 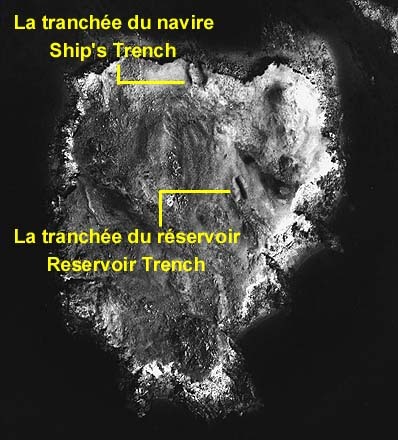 The "Reservoir Trench" is located 100 m southeast of the Ship's Trench and runs 25 m further to the southeast, in the same orientation as the Ship's Trench. 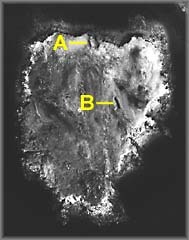 This suggests that a single vein of ore was being followed across the island. The original belief that the trench was dug to hold drinking water for the crews is unlikely, although water does collect there in early summer. It was almost certainly a mine, about 5 m wide and varying from 1 m deep at the north end to over 2 m deep at the south. The "Industrial Area" is a flat, slightly sloping area located between the Reservoir and the island's east coast. The area reaches 80 m inland to the northwest. Coal, slag, and fragments of charcoal and industrial ceramics found in this area indicate the site served as the centre of industrial activities associated with the mining operations, while other remains suggest several buildings had been erected here. The precise character or purpose of the various distinct features is not yet certain. They would have included one or more assay offices and possibly a smithy. Another of the major features, of which there remains only a jumble of boulders, is the "Frobisher House". 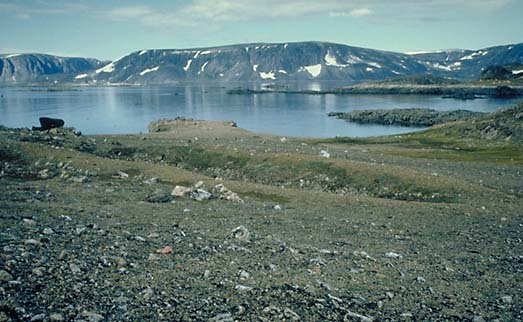 Lesser features on the island include a pair of isolated, vertical boulders which may mark one or two graves of Frobisher's men, and two large areas of scattered boulders, tentatively categorised as the remains of cairns marking caches of buried supplies. Some cairn remains, as well as other boulder groupings indicative of tent-rings, may be of Inuit rather than Elizabethan creation.